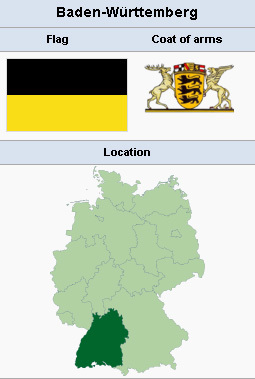 Baden-Württemberg is one of 16 states of the Federal Republic of Germany, with a population of 10,755,000 in 2007. It was formed from three areas of the French and American occupation zones after World War II: Württemberg-Hohenzollern and South Baden (both occupied by France), and Württemberg-Baden (American-occupied). After a short period of recovery from the war 's devastation, the state has become, with its modern industry, one of Germany 's most prosperous states. The 12 Mennonite congregations of Baden-Württemberg belong to the Verband deutscher Mennonitengemeinden. 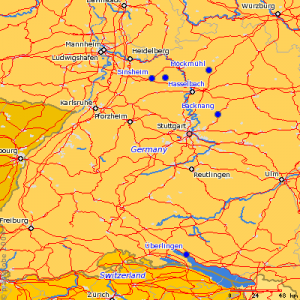 They are the following: Backnang, Freiburg (until 1965 Schopfheim), Hasselbach, Heidelberg, Heilbronn (the Nesselbach congregation joined Heilbronn in 1975), Karlsruhe-Thomashof (formerly Durlach), Möckmühl (Adelsheim joined Möckmühl in 1980), Reutlingen, Sinsheim, Stuttgart, Überlingen and Wössingen-Bretten. Baptized membership in Baden-Württemberg congregations was 1,012 in 1986. This constitutes two-thirds of the entire membership of the Verband. Preaching is done by 28 lay preachers and two salaried preachers. In the second half of the 20th century congregational life became more active, and activities became more varied. Numerous meetings in groups and circles were held. Women's involvement increased. Young people determine for themselves when they are baptized. The small congregation of Hasselbach, together with the Evangelische Landeskirche (Protestant State Church), annually organized a children's camp, which was well attended. The old congregational meetingplace of Hasselbach was expanded. The neighborhood center, presented to the Heilbronn congregation by American Mennonites in 1948, was replaced by a newly constructed building in Kochendorf. The church in Möckmühl intended to build its own meetingplace. Although there was a tendency to give up farming due to changes in economic conditions, in 1986 there were still 42 Mennonite farms in Baden-Württemberg. Lichdi, Elfriede. "Baden-Württemberg (Germany)." Global Anabaptist Mennonite Encyclopedia Online. 1987. Web. 23 Apr 2019. http://gameo.org/index.php?title=Baden-W%C3%BCrttemberg_(Germany)&oldid=90963. Lichdi, Elfriede. (1987). Baden-Württemberg (Germany). Global Anabaptist Mennonite Encyclopedia Online. Retrieved 23 April 2019, from http://gameo.org/index.php?title=Baden-W%C3%BCrttemberg_(Germany)&oldid=90963. Adapted by permission of Herald Press, Harrisonburg, Virginia, from Mennonite Encyclopedia, Vol. 5, p. 49. All rights reserved. This page was last modified on 23 August 2013, at 13:52.